The Columbia Model 5421 Single-Channel Power Supply provides a convenient unity gain interface between any Columbia 8000 or 900 Series Integrated Piezoelectric Accelerometer and a variety of display or analyzing type instruments. This supply provides a 4.0 mA DC constant current to the pre-amplification circuitry within the transducer thus eliminating the need for a complex and costly charge amplifier. This current source will permit the use of any length output cable up to 500 feet long. The Model 5421 requires a user-supplied source of DC voltage between +12 and +32 volts. The minimum voltage should be chosen to be at least six volts greater than the specific output bias level of the selected transducer. The BNC output jack provides a convenient interface for oscilloscopes, spectrum analyzers or other signal analyzing instruments. 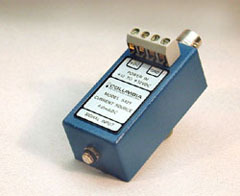 It may be directly connected to the BNC input of an oscilloscope or other instrument by the use of a UG-491 BNC plug-to-plug adapter. (1 Hz To 20KHz): 75 V RMS Max.